Are your living spaces in need of order? Mix and match the three sizes of Stacking Drawers to create a customized storage system and give everything a place to be stored! 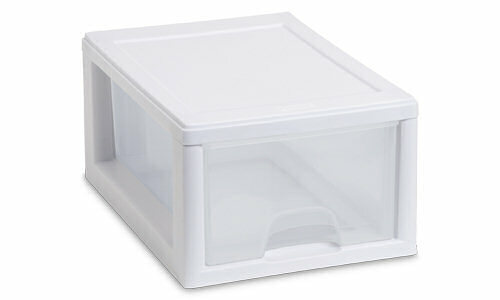 The 6 Quart Stacking Closet Drawer helps to organize closets and living areas simply. Drawers neatly stack on top of each other creating storage towers and offering flexibility in expanding as needed. Organize, sort and store everything; from shoes and accessories, to health and beauty items, jewelry, crafting supplies, and more. These drawers are designed to work together in a variety of configurations. The overall assembled dimensions for this item are 12 7/8" x 8 7/8" x 6". 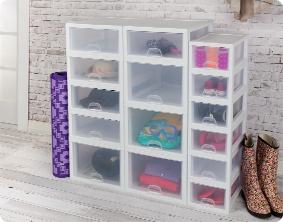 Overall Assembled Size: 12 7/8" x 8 7/8" x 6"
Use Stacking Closet Drawers to create a storage system and take advantage of that extra underbed space. Are your living spaces in need of order? Mix and Match the three sizes of Stacking Drawers to give all those things a place of their own! 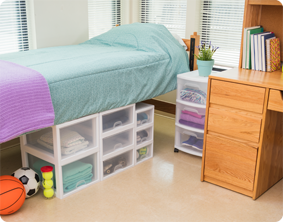 Get your dorm or bedroom organized! 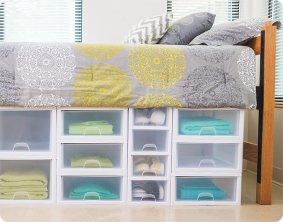 Use Stacking Drawers to store your shoes, towels and accessories! 6 Quart, 16 Quart and 27 Quart sizes are sold separately. 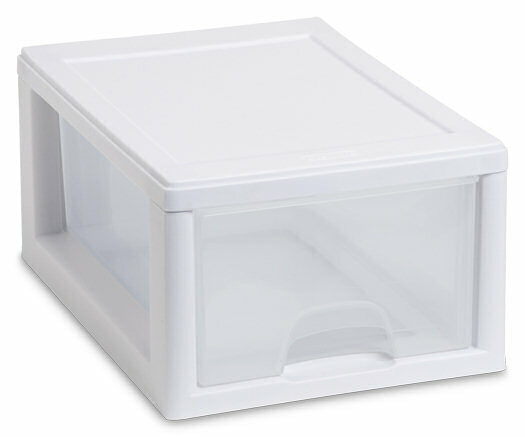 6 Quart Stacking Drawer is rated 4.7 out of 5 by 3. Rated 5 out of 5 by Roxyfur from built to last! I've had this drawer system for a few years and it gets a lot of use in my laundry room closet. It shows very little wear and tear and the drawer still slides nicely! Rated 5 out of 5 by Old Man Ed from Used to organize medications for elderly neighbor. I have been assisting a neighbor who is 95 with poor eyesight and motor skills. He takes many medications at 5 different times during the day. For over 4 years I have had to make nightly trips to his apt to refill his individual bottles that are marked with large numbers showing him what time of day to take them. I had a trip to see my daughter out of state and my neighbor has no family to stop by and check on him or help. I puchased 6 of the small drawers that are very easy for him to open. I found some 2 oz mini cups where I place his medications in and marked each drawer with the time to take them on the front in large numbers, 6AM,7AM,10AM,4PM and BED. The 6th drawer I use for the refill bottles. A total of 33 mini cups can be placed in each drawer. Now instead of having to refill each bottle nightly I fill an entire months worth of meds and it works out great. If I go out of town he has 30 days of medications he can take by himself. Even his therapists and nurses that check on him say it is great idea. Would love to see Sterilite develope "mini cups" to use for such purposes to help the elderly. I have alot of their products and love everyone of them. I would love to load a photo however I have never done this and have an old computer. I will mail one to Sterilite. Rated 4 out of 5 by Sandy from Had to find a way to store my shoes My shoes were everywhere and piled in my closet makin it difficult to find matching pairs. I had to find away to keep my shoes organized. I bought a bunch of these from my local store cause I liked that they stacked on top of each other. Now I have more room in my closet and can find my shoes easy!